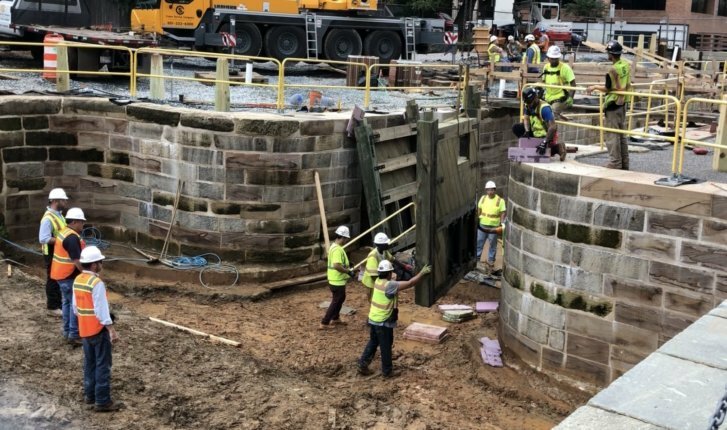 The southernmost portion of the historic C&O Canal is a step closer to realizing its former glory in D.C. On Thursday, big wooden gates that eventually will manage water flow between locks 3 and 4 in Georgetown were added. See photos and video. WASHINGTON — The southernmost portion of the historic C&O Canal is a step closer to realizing its former glory in D.C.
On Thursday, big wooden gates that eventually will manage water flow between locks 3 and 4 in Georgetown were added. Restoration of the nearly 190-year-old stone-lined ditch involved it being meticulously deconstructed and reassembled. Replacement stones came from the same place the original blocks were mined. The quarry about 40 miles away in Virginia was also used for stone to build the White House. The Georgetown reconstruction project is part of a larger plan. The National Park Service is partnering with the nonprofit Georgetown Heritage to revitalize a mile-long stretch of the C&O Canal through Georgetown. The targeted area is between the canal’s mile marker zero, which is where Rock Creek meets the Potomac River near Thompson’s Boat House. It stretches along the canal to the remains of the Potomac aqueduct, just north of Key Bridge. The idea for the multiyear plan is to create pockets of places for different activities, such as sitting quietly in a natural area to watch a nesting great blue heron. “In another section of the park, it’s going to be more active, and that’s where the boat will be operating right here in locks 3 and 4, where school kids will come and ride the boat on a field trip, where tourists can come and learn a little more about the area,” said Maggie Downing, director of programs and partnerships for Georgetown Heritage. “And then, in other places, it’ll be more focused on recreation, where you can put a kayak on the canal and go paddling,” Downing said. The restoration project is expected to wrap up late this year or early in 2019. Sometime in 2019, water will be brought back into the canal. Also in 2019, boats might return to the canal in Georgetown to be pulled along like days of old under the power of mules. The C&O Canal National Historic Park extends between D.C. and Cumberland, Maryland.